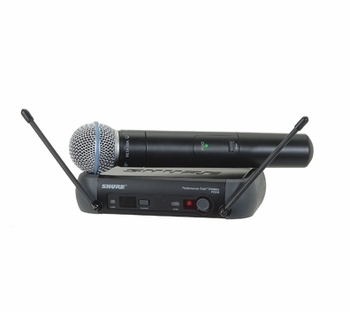 Shure PGX24/BETA58 Wireless Microphone Vocal System DJParts - All Variety of Parts that DJ Needs. Home > DJ Gear > DJ Microphone/Wireless System > Shure Microphone > PGX Wireless (UHF Frequency Agile Wireless Microphone System) > Shure PGX24/BETA58 Wireless Microphone Vocal System - Free Shipping!!! Shure PGX24/BETA58 Wireless Microphone Vocal System - Free Shipping!!! Includes PGX2/Beta58 Handheld Transmitter and PGX4 Diversity Receiver. A premium live performance system that reveals fine details in demanding environments.